Yesterday, a Los Angeles Superior Court judge ordered the popular Sriracha hot sauce maker, Huy Fong Foods, to shut down any operations at its Irwindale plant that could be causing the health issues experienced by surrounding residents. 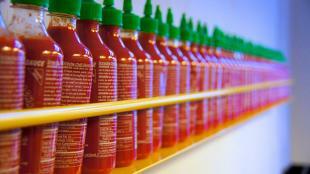 The lack of clarity around what operations will be shut down and fears of a future shortage is prompting many Sriracha lovers to stock up. With jars beginning to disappear from local stores, you may be contemplating how to make your own Sriracha at home and avoid the issue all together. Anything, however, that could drive a town to sue simply because of a smell should be handled with caution. Therefore, if you are planning to make your own Sriracha, we’ve got some safety tips from the restaurant industry to help you avoid having to shut down your kitchen. Chiles of any kind, including the red chiles used in most Sriracha recipes, should be handled with caution. Chiles contain oils which can burn your skin and will sear if it comes in contact with any of your mucous membranes (lips, nostrils, or eyes). To make Sriracha, you’ll need to de-stem, seed and chop red chilies, such as Fresnos, Thai or jalepeños. When handling chiles, chefs will often use rubber gloves. You can also coat your fingers with shortening to avoid the oil interacting with your skin. Do not touch other food items while working with chiles. Clean the workspace and thoroughly wash any utensils. If you do come into contact with chile oils, soak skin in vegetable oil, whole milk or use a topical skin-numbing cream to help reduce the pain of the burn. If you ingest a hot chile, do not drink water—instead, drink milk or eat yogurt. Since Sriracha recipes typically include tomato paste, vinegar and sugar, the finished recipe shouldn’t burn when consumed. Take it from the restaurant pros—proper food handling techniques will help you avoid the pain of making Sriracha, or any other chile dish, at home.